Threatening and destructive, an opossum’s reputation is both well-known and fairly well-deserved. These pesky animals can turn your attic, garage, or crawl space into their own personal toilet, and cause a variety of health issues, especially if you have pets. They are easily adaptable and can inhabit just about anywhere. Opossums have a tendency to reproduce quickly once they’ve found a safe place they’d like to call home. And that spells trouble. If you are concerned that you have an opossum infestation in your home of commercial building, reliable wildlife management services are a must. Getting rid of these pests isn’t impossible – it just takes a little know-how. Opossums tend to “play dead” as a defense mechanism, but don’t let them fool you. 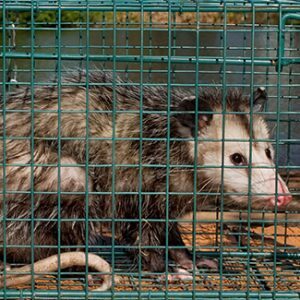 Our team has been removing opossums from the Houston area for nearly 25 years. We’ve come up with a humane solution that works. As a part of our opossum removal services, we safely capture and remove opossums by baiting them with food or tasty treats that they enjoy and that are safe for them, and then place traps in areas on your property. When it comes to trapping opossums, leave it to the professionals who understand their tendencies and who are trained to trap them effectively and quickly. Call us to remove the troublesome opossums from your property today.